The system configuration PROM is a cold-service component that can be replaced only by authorized service personnel. Before beginning this procedure, ensure that you are familiar with the cautions and safety instructions described in Safety Information. Note - The System Configuration PROM is plugged into a socket on the motherboard. It includes a yellow barcode label. Remove the main module from the server. 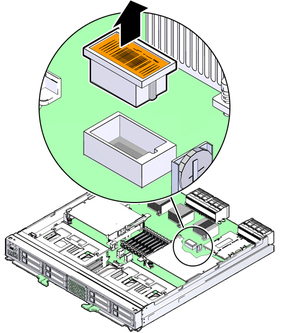 See Remove the Main Module. Take the necessary ESD precautions. Locate the system configuration PROM on the main module. Grasp the system configuration PROM and lift it up to remove it from the main module.